HAPI Drum designer and worldwide supplier. How is a HAPI Drum played? We recommend playing the HAPI drum with the pads of your fingers. A wide range of sounds can be created with different techniques. Playing by hand connects you with the HAPI drum in the way that traditional drums are enjoyed. A minimal amount of force creates a big sound on our drums. We also supply each HAPI Steel Tongue Drum with mallets designed to bring out the pure sound of each note. Our mallets eliminate “head slap” creating a very clear tone. The arrangement of the notes make going up and down the scale very easy. Also one hand can reach two or three notes simultaneously for chord playing. We have custom designed isolating rubber feet on the bottom of every drum. Set the drum on any surface and still get a great tone! Can anyone play a HAPI Steel Tongue Drum? Sure! 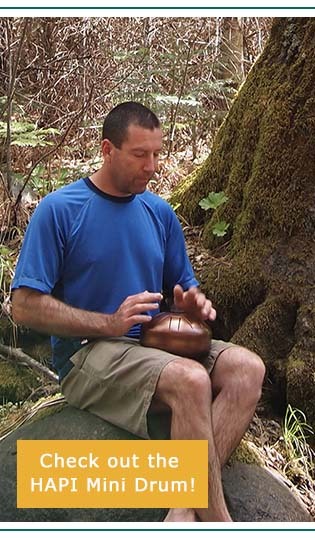 Anyone who wants an easy to play intuitive percussion instrument can play one. You don't need a musical background to enjoy it. 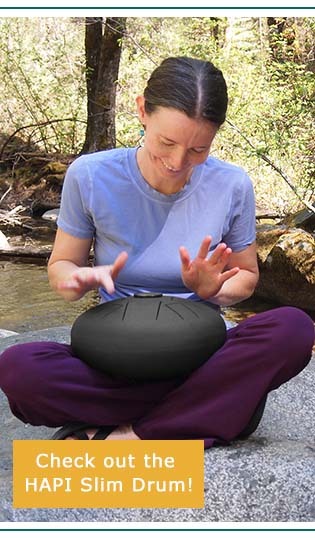 The HAPI (Hand Activated Percussion Instrument) Steel Tongue Drum is ideal for jamming and playing percussive beats. The note layout of the HAPI drum makes it easy to jump right into grooving rhythms. 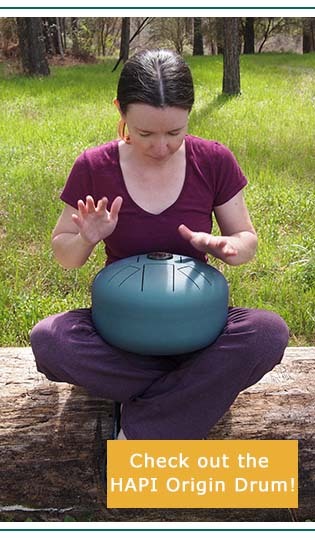 Enjoy creating a soothing harmonic journey with your HAPI drum. You will love being able to add a melodic component to your beats. An intuitive arrangement to the notes makes it easy to explore new musical horizons. The strong meditative tones are calming and great for relaxing anytime. And because of its compact design you can take it outside to enjoy on a nature hike or sitting around the campfire in the evenings. How is the tone created? 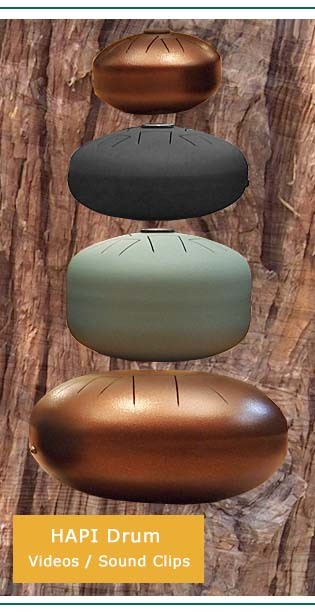 The unique tone of the HAPI drum is created by a tuned vibrating tongue of steel. The concept is similar to a wooden tongue drum. When a tongue is quickly and lightly struck with the finger or mallet it vibrates creating sound waves. By changing the shape and length of the tongue optimal vibration and perfect tone is achieved. By arranging the notes in our unique way each note when struck excites surrounding notes that are musically compatible with it. This adds to the harmonic spectrum of the tone. Rather than just one tone we can now create a spectrum of supporting sound for each note. The tone is similar to singing bowls or musical bells which create multiple harmonic overtones. The body of the drum acts as a resonating chamber adding depth to the note. We have carefully chosen an opening port in the bottom of the HAPI drum that serves three functions. The bottom hole allows the sound to escape and increases the volume. It releases the tone from the body so that the notes do not overlap each other too much. This is especially desirable for faster playing. It allows the player to open or close the port with their lap and chose different resonance levels for a different effect. We have added additional dampening of the notes and HAPI drum body to keep the drum from becoming discordant and “ringy”. Our breakthrough proprietary technique built into each HAPI Steel Tongue Drum provides excellent resonance while supplying the correct amount of dampening. How is the HAPI Drum different from a Hank Drum? Our HAPI Drums use tongues cut to different sizes to produce its tones. The steel is thicker at about 2mm. The original concept of using steel tongues came from Dennis Havlena who began cutting tongues into propane tanks in 2007. These types of drums are called Hank Drums, a play on words mixing Hang and Tank together. Starting with his concept, we began experimenting with different custom made musical steels and our own unique note layouts to build on Dennis' original idea. We have also created our own molded shapes to make our HAPI Steel Tongue Drum line of instruments. The HAPI Mini, Slim and Origin use eight note pentatonic scales arranged around the top. The HAPI UFO uses eleven notes in the C major scale. It has a center note similar to a Hang but rather than being a lower pitch to the scale it is musically in the middle of the scale. 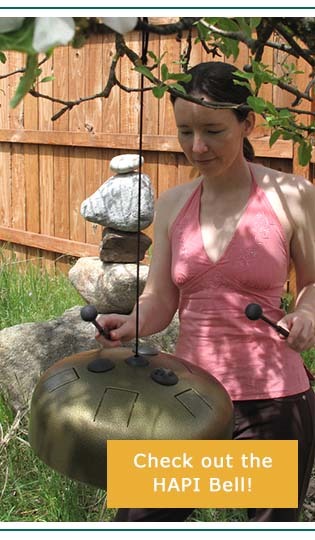 The HAPI Bell is a combination of a steel tongue drum, bell, gong, and singing bowl. How is the HAPI Drum different from a Hang? 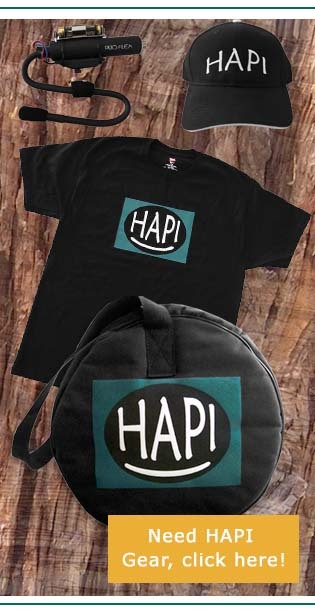 Our original inspiration for the HAPI drum came from the Hang. The Hang (pronounced hong) was developed in 2000 in Berne, Switzerland by Felix Rohner and Sabina Schärer of PANArt. 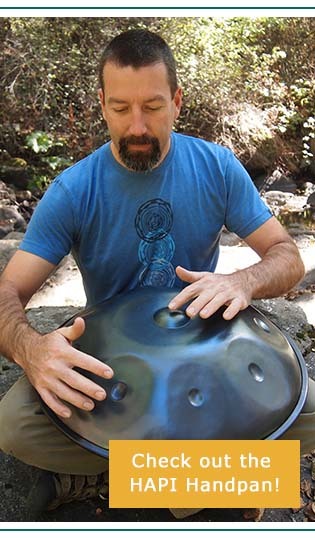 The Hang is a hand played steel instrument that is typically used resting on the musicians lap. The Hang is made from two deep drawn nitrided solid steel sheets that are shaped and attached together. The Hang is hammered similar to a steelpan to create its perfect tonal fields. The Hang uses some of the same physical principles as a steelpan but with a nitrided surface. The steel is relatively thin at 1mm. The domes vibrate at different tones and harmonics depending on the size and shape that is hammered into the steel. The tuning process for a Hang is a very time consuming art. The Hang usually has a total of 9 notes. An eight note pentatonic or hexatonic scale around the sides and a lower "ding" note in the middle. We have just begun creating our own handpans, more info is available here. 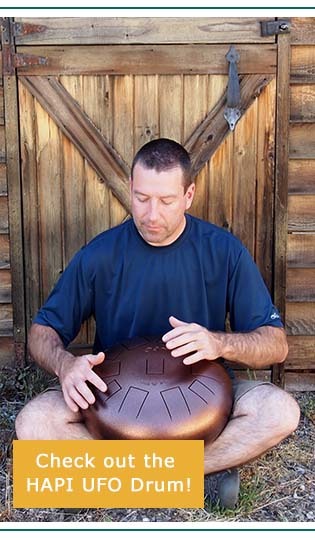 Why is the HAPI Steel Tongue Drum unique? 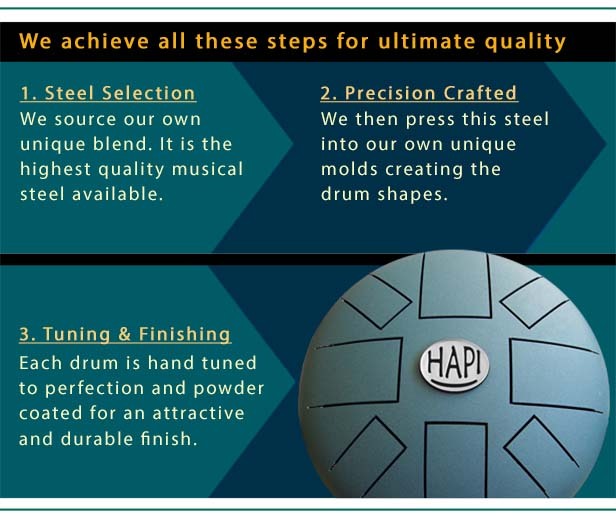 We have created some unique design parameters that make the best possible steel tongue percussion HAPI drum. Our Patented (D620,041S) note layout adds harmonic tones to each note when played. This creates a more complex and musical tone to each note. By placing low notes next to the appropriate higher notes we achieve multiple harmonics. Their vibrations create desirable overtones which compliment the timbre of the tone. We use a compact drum body that easily fits in your lap. We have tested the sound quality of different types of steel and use a unique mixture of alloying elements to achieve the best sound possible. We also use our own unique mold for shaping the steel into the HAPI drum.